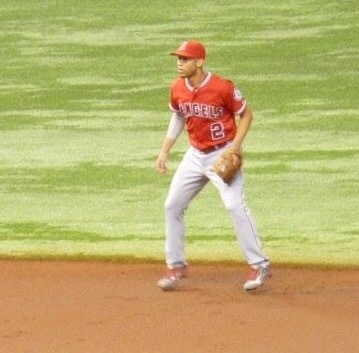 Andrelton Simmons Trade: How Has This Move Worked Out For The Angels? Today, I would like to check on a trade that happened this past off-season that involved the Los Angeles Angels and Atlanta Braves. This is more of a report card than a determination on who won the trade. We will all determine who won the trade later down the road. Now, the deal was lopsided, as the Angels gave up two top quality pitching prospects in Sean Newcomb and Chris Ellis. The Braves also received Erick Aybar, who has been a big disappointment and is only a stop gap player until Dansby Swanson or Ozhaino Albies is ready, which they are close on coming up. On the other hand, the Angels got a top three defensive shortstop in Andrelton Simmons, who is still developing into a better offensive weapon. He has shown consistent numbers at the plate, but sooner or later, he could be the next Brandon Crawford, who was just a defensive guru, but figured out how to swing the bat, so Simmons is much younger and could become a force like Brandon Crawford of the San Francisco Giants, if he shortens his swing. Interestingly, I was shocked when this deal went through knowing it was a solid move for both teams, as the Angels were in a more win now like mode than the Braves. That has not worked out so far for the Angels with injuries piling up left and right. Overall, the Angels made a mistake by trading their former number one ranked prospect, who is only a season or two away on becoming a regular in the Braves’ rotation. They could have kept Aybar or traded him and signed Ian Desmond or Asdrubal Cabrera instead of trading Newcomb and Ellis for a defensive minded shortstop. Finally, Simmons is producing at the plate like he did last year. He has hit one homer and drove in 18 RBIs. Through 51 games, he has batted .261 with a on base percentage of .284, which he needs to improve on getting on base more to be the complete shortstop that people have predicting him on becoming. Lastly, he has 15 career triples. Sooner or later? He’s getting worse with the bat, not better… Don’t just make a statement that he’ll turn into Brandon Crawford… Simmons is a below average hitter who is likely never to even be average with the bat. No denying his glove wizardry, but he’s replacement level at the plate. Yes sooner or later. Simmons is young and could turn his swing around. If not soon this problem will be fixed later like Crawford. I not making a statement that he’ll turn into Crawford, just saying he could go down that road on becoming a better hitter in his late 20’s like Crawford. Simmons is not league average with the stick yet, but he puts up consistent numbers on what you expect him to do. Right now he is a consistent .250-.260 hitter and it has shown last year and this year. At the bottom of the lineup, I think Simmons is perfect, as he can get the job done and proved it this past series against the Rays, yes I know the Rays are not a good team, but those players are in the Majors and Simmons delivered.